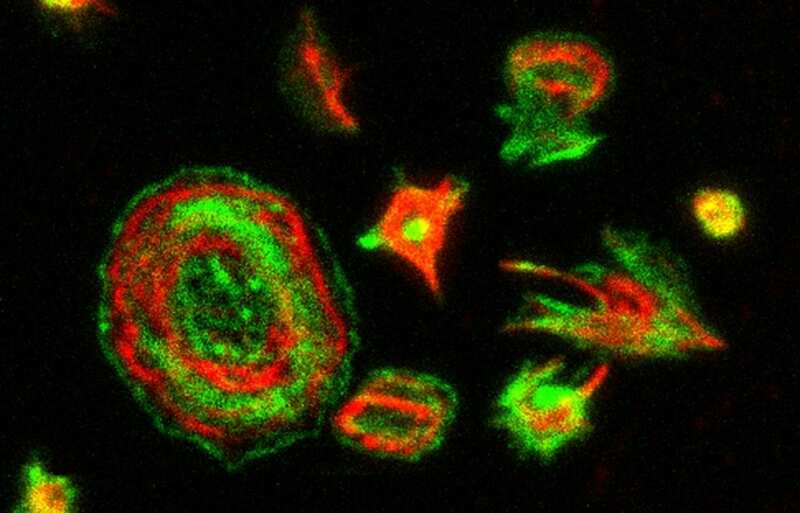 The Cell Division and Cancer Group of the Spanish National Cancer Research Centre (CNIO) has discovered that MASTL, the protein whose function in the organism has not yet been sufficiently investigated, plays an important role in controlling the cytoskeleton, the structure that gives shape to the cells, and enables their mobility and capacity for grouping. The researchers have managed to link the protein to the origin of an inherited thrombocytopenia and they point out that this discovery might have implications in the fight against cancer metastasis. The findings have been published in the Journal of Clinical Investigation. Until now we have known that MASTL plays a role in the regulation of cell division, but not much else. In 2003, a team of American researchers identified a group of patients with inherited thrombocytopenia that had a mutation on the MASTL gene. Thrombocytopenia is a condition characterised by low levels of platelets, so the patients' bodies cannot form clots and their symptoms include uncontrollable bleeding that can lead to hematomas and haemorrhages. The thrombocytopenia found in these patients, caused by the mutation on MASTL is known as autosomal dominant thrombocytopenia or thrombocytopenia-2. CNIO researchers decided to study this particular mutation in the hope that it might lead them to discover more about the functions of the protein. "There were no previous connections that would tell us how a protein that regulates cell division could regulate the number of platelets", says Begoña Hurtado, lead author of the paper together with Marianna Trakala. To study this relationship they generated a line of genetically modified mice that were carriers of the same mutation found in the patients with thrombocytopenia-2. Together with the CNIO Proteomics Core Unit, led by Javier Muñoz, they discovered that the mutating platelets have a different morphology and different protein content that resulted in an altered cytoskeleton. The cytoskeleton gives stability and shape to the cell, apart from determining its mobility, playing the role of a 'muscle' cell. It also governs cell interaction and grouping. The study has discovered that the mutation on MASTL causes defects on this 'muscle', which, in the case of platelets, is fundamental in forming the clots that protect us from bleeding out. The observations have allowed us to identify the molecular bases of the mutation that causes the thrombocytopenia-2 in patients, which not only broaden our knowledge of the factors that participate in the origin of the disease, but also allow us to try out different therapies. The CNIO researchers were able to avoid the defect caused by the mutation by manipulating other enzymes of the cytoskeleton with chemical inhibitors that were already available at the clinic. But the discovery that MASTL controls the cytoskeleton can have applications in cancer metastasis research. "The cytoskeleton is crucial for many cellular functions, but the cell signalling and adhesion to the medium properties (i.e. those associated with cellular migration and invasion) are the most important ones", explains Marcos Malumbres, the Group leader and project manager. Metastatic cells go through a special process of breaking away from their usual environment, they are able to modify their cell shape to 'escape' through the bloodstream and end up attaching themselves to new tissues starting the process of metastasis. Malumbres's Group has already discovered that MASTL could be a therapeutic target and that its inhibition could slow down the growth of breast tumours: recently they published their findings in the journal Cell Death & Differentiation where they describe how the levels of the protein are increased in some patients, and how its inhibition in experimental mouse models slowed down tumour development. The next step in our investigation would be to analyse to what extent the expression of MASTL in tumours modulates its invasive or metastatic ability", says Malumbres. The continuation of this work could open up new avenues for potential applications of MASTL inhibitors in cancer therapies. The study published in Journal of Clinical Investigation has been funded by the Spanish Ministry of Science, Innovation and Universities, Fundació La Caixa, Fundació la Marató of TV3, the Community of Madrid and the Worldwide Cancer Research.